I never dreamed of my wedding as child. I knew I didn’t want to spend a ridiculous amount of money on a dress like “those” TV brides. Then, I got engaged and became excited to attack my biggest styling project thus far. I planned all the details for my July 30th wedding (Ojai/outdoors/intimate), but was dragging my feet to start dress shopping. I don’t feel like a typical bride and after the holidays, the last thing I wanted to do was try on a big white dress! I decided to approach dress shopping as I approach personal shopping for a client’s red carpet gown. Thankfully, it is a lot more fun, but there are a few rules to follow to maximize your time and so you can say “Yes” to the dress. Here are my 15 essential tips for wedding dress shopping. 1. Wedding dresses sizes run small! It’s hard to imagine an industry set on making a women feel special, starts with sizing up to 3 times smaller than your regular dress size. Well, it does and it stinks. Go in with an open mind and focus on the dress fit and not the number on the tag. 2. Plus Sized women will have a harder time. As a continuation to number one, dress shopping is even more difficult for plus-sized women. Most stores carry up to a sample 12- which is like an 8. The average sized US woman is a size 14! This can leave curvy brides feeling helpless and stuck with limited options. The key is to search for bridal boutiques that cater to the curvy girls! 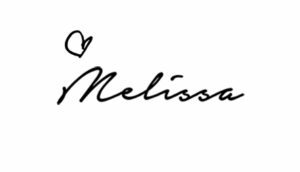 Most designers (Casablanca, Watters, Maggie Sottero) can order a dress in your size. This should come as no surprise that personal styling has more to do with fit than trends. 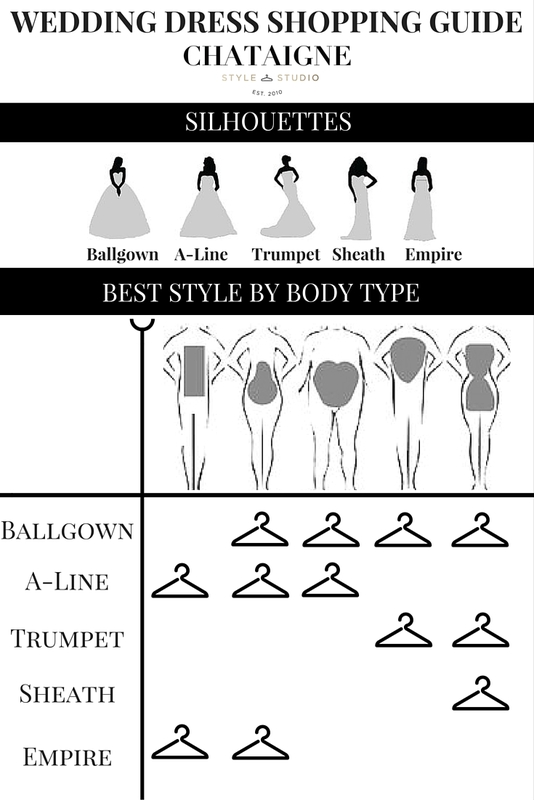 Knowing your body type is imperative when shopping for “the dress.” It will save you lots of time so you can narrow your choices. Follow my wedding dress shopping cheat sheet below. 4. Go with a wing-girl, but not an entourage. I did most of my shopping solo and sent pics to my bridal party and mom in Chicago. When I actually found “the dress” I had a trusted wing girl with me, which made the process a lot easier. Too many cooks in the fitting will make your head spin. Focus on you and keep it simple. Go to the bridal salon put together and your hair done. You don’t have to be red carpet ready, but a little effort helps you visualize your look. Going hungover and sloppy doesn’t help anyone. 6. Be ready to be naked. Wedding dresses are difficult to get in and out of on your own, and bras-less is the way to go. Be prepared to show off your, stomach, legs, and the girls. Also, eating a big lunch before is not recommended. With sizing already small you don’t need the extra bloat. Don’t be afraid to step outside your comfort zone. Most brides end up choosing something they didn’t expect. Even if you would never would imagine yourself in a ball gown (I sure didn’t), try one on anyway. When is the next opportunity you’ll get to try on something so ridiculous fabulous? Wearing a body shaper under your clothes helps smooth lines and lumps. You’ll feel a bit skinner and it helps with feeling over exposed. Don’t stress about shoes. You won’t have an idea of the style yet and if you are below 5’8 they will most likely need to hem your dress anyway. 9. Most Dresses look awful on the hanger. As I stylist, I know what works for me and my clients. I was shocked when my bridal consultant told me to try this ugly-looking dress on a hanger. Well, little did I know, it turned out to be my wedding dress! Lesson? Try it on. You will be surprised! 10. Don’t stand in one spot…MOVE! It’s fun to stand on the pedestal like a princess, but on your actual wedding day you won’t just be standing still. You’ll be making rounds with guests, dancing, and sitting. You have to move to see if you can wear this dress all-day. 11. Keep you location in mind and use style keywords. You won’t offend your bridal consultant by saying ‘no.’ You’ll be helping her by being nitpicky. Vocalize what you love and hate. She’ll be able to absorb your thoughts and help you move on to the next dress. 13. Save room in your budget for alterations. Every dress and suit looks better with a custom fit. Alterations make all the difference and sometimes they can be costly. Get a seamstress recommendation from your salon. Hems, Bustles, and aligning beading adds more expense, especially if your dress is too small! If you are between sizes go with the larger options. It costs more to let it out than to take it in! You may find the dress of your dreams for less at a local trunk show. Don’t be afraid to work them on the price. I negotiated and an extra 10% off! The most important thing is to choose something that you feel amazing in that captures your essence! Personal style is not about the clothes, but how your rock it. That confidence you’ll be beaming will take his breath away. Hope you found this wedding dress shopping guide useful. Please share it with your friends and future brides-to-be! Pin it to your wedding Pinterest boards and let me know your thoughts in the comments below.